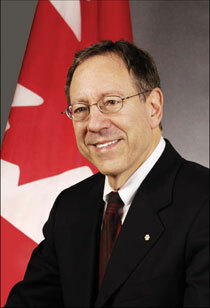 Irwin Cotler, 66, has been a member of Canada’s Parliament since 1999, when he coasted to victory representing his Montreal district with 92 percent of the votes. He served as minister of justice from 2003 until earlier this year when he became a leader of the opposition Liberal Party. A lawyer and lifelong fighter for human rights, he is on leave from McGill University, where he directs the Human Rights Program. Cotler has earned five doctorates, taught at Harvard and Yale, and represented prisoners of conscience ranging from Nelson Mandela to Natan Sharansky and Andrei Sakharov. He feels equally comfortable at the International Court of Justice in The Hague as in his local synagogue. Q. You paint today’s world in cataclysmic strokes. Why do you think history is moving faster than in the past? A. This has undoubtedly been a year of political earthquakes wielding tremendous impact on Israel and world Jewry. Heading the list must be the phenomenon of state-sanctioned genocidal anti-Semitism. I do not use these words easily, but nothing else can describe [President Mahmoud] Ahmadinejad’s Iran, which has become the epicenter of this dangerous policy. It is a toxic convergence of genocide embedded in virulent hatred and anti-Semitism, driven by a program to acquire nuclear weapons and the public threats of eliminating Israel. This man seeks nothing less than a Middle East Holocaust, even while he denies the European Holocaust ever took place. Q. You called for Ahmadinejad’s arrest during his fall visit to the United Nations. Did you mean it literally? A. I belong to a group of lawyers who are working to bring Ahmadinejad to justice for his clear violations of the [United Nation’s] Genocide Convention, which speaks of the prevention and punishment of genocide and prohibits the direct and public incitement to this crime. Even while the world debates sanctions and military strikes, here is a case where the evidence is clear and remedies exist. We must make it clear to the Iranian people that it’s not they who are being sanctioned but rather their president for his violations. Q. What other developments caused you to raise the alarm? A. The second was the election of the Hamas government in the Palestinian Authority. Here the genocidal threat is not simply declaratory, through pronouncements [like those of] Iran’s president, but even stronger—part and parcel of their charter which vows the destruction of Israel and the free use of terrorism to achieve that end. The Hamas Charter is a chilling document, a contemporary Protocols of the Elders of Zion. Rather than the world calling on Hamas to recognize Israel, cease terror acts and accept existing international agreements, we must insist [that] Hamas revoke and nullify its charter…. Beyond Hamas, we also witnessed during this period a sharp globalization and intensification of radical political Islam. Not a new phenomenon, it has been mainstreamed without precedent recently through [the rise of] Hezbollah, the Muslim Brotherhood, Al Qaeda and Saudi Wahhabism. Q. Can you cite some specific cases that underscore your general concerns? A. The cartoon controversy [in Denmark] was certainly a prime example. We saw the worldwide violence that was unleashed, but not everyone realized that a running theme was that the Jews, the Zionists, were behind this Danish situation. Just as the Jews are absurdly blamed for 9/11, for the avian flu pandemic and so on. I am troubled also by…cases of homegrown Islamic terrorists in London, Miami, Toronto and many other places. Polls indicate that 80 percent of British Muslims say they would regard British Jews as legitimate targets. We see a resurgence of the canard of dual loyalty lodged against Jews, especially in academic and intellectual circles, such as blaming local Jews for prodding America or Britain into the Iraq war. We saw the U.N. Human Rights Council, supposed to replace the U.N. Human Rights Commission with a new era of reform in which Israel would not be singled out for discriminatory treatment, abandoning that hope and following the same road of its predecessor. Q. What about the Israel-Lebanon war? A. Yes. Incredibly, U.N. Security Council Resolution 1701’s basic particulars have still not been implemented. The kidnapped soldiers have not been returned, although their unconditional, immediate return was the first test of this resolution. Hezbollah has not been disarmed, and neither Lebanon’s government nor the U.N. have said they will take on that long-agreed upon goal. Q. Are there other things that bode darkly for Israel and the Jewish people from this past year? A. Unfortunately, the list continues. The petroleum- multiplier market has fed rather than curbed petro-politics and petro-terrorism. As the world slowly began moving to stop the genocide in Darfur, one hears the president of Sudan opposing the U.N.’s belated multinational protection plan and on what basis? That the plan is a Zionist plot! My point is that real earthquakes are happening, with the potential for transformative impact on Israel and world Jewry. Appropriate responses and initiatives are absolutely required not only by the Jewish state and Jews everywhere but by the international community…. Q. Why did so many pro-Israel observers welcome the election victory of the Conservatives in Canada, when the Liberal government had you as a senior minister? A. The security, legitimacy and well-being of Israel have been a cornerstone of Canadian foreign policy as embraced by successive governments, Liberal and Conservative alike. My government supported a two-state solution…rejected terrorism and saw Hamas and Hezbollah as terror organizations. We respected human rights and democracy and opposed racism…and anti-Semitism. To give the Conservative party credit, they seem to have gone even beyond some of the positions we staked out in the U.N. and they supported Israel’s right to defend itself during the war in Lebanon. This message was said clearly, early and with a moral clarity that the Liberal Party did not share—in the midst of a heated 10-candidate leadership race. Yet my party shared that same principle and I, in fact, did articulate the principle of Israel’s right to self-defense. Q. You combine unwavering leadership on the human rights front with forceful advocacy of Jewish rights, Israel and Zionism. Why are there so few people like you? A. I am lucky. The first words I spoke after being sworn in [as justice minister], when we were ushered out to meet the media, was that my work would be guided by one overarching principle, ‘Tzedek, tzedek tirdof.’ And I said it in Hebrew. I was brought up with [this] moral imperative of…‘Justice, justice pursue.’ This value has always guided me, along with Hillel’s teaching, ‘If I am only for myself, what am I?’ His wisdom was the ultimate combination of the universal and the particular. If we do not affirm our own ethics and…our own values and vision of our history and heritage, how can we expect others to understand, let alone respect, who we are? If we do not get involved in the larger struggle for human rights, we not only diminish that agenda, but also ourselves as Jews. Q. On a very different topic, how did you find the time to become an international table tennis competitor? A. I always dreamt of representing Canada in the Maccabiah Games [in Israel]. I stumbled across the fact at some point that nobody had signed up to play Ping-Pong at the games for Canada. I signed up in 2005 and turned out to be the only individual in the ‘Masters’ Category.’ That sounds impressive but all it really meant was that all of us were over 35. My son asked me if it was a one-time elimination where I would be humiliated only once, or a round robin where I would be humiliated day after day. It was a one-rounder. I faced a Mr. Stein and actually won the first game. I think he let me. Then he won the next three and went on to win the gold medal. I must say that it was an incredible experience, inspiring, that allowed me to fulfill a childhood dream while allowing my family to have a good laugh at the same time.